PLEASE NOTE: These instructions are for our G series motor timers, part number MCGT-1W-RF (1 ch) and MCGT-5W-RF (5 ch). We have stand-alone timers can be used to activate our radio equipped blind and shade motors using RF (Radio Frequency) for transmission of a remote control signal. You can assign as many motors as you like to a single timer, and you can have multiple timers in your home. This is a four part article series on how to set up the timers. The MCGT-1W-RF wireless wall mounted timer transmits the radio signal to a small antenna in the motor; a microprocessor then decodes the signals to activate the motor. The timer is able to memorize different timing event triggers for each day of the week, organized in a sequential fashion from Monday to Sunday. The RF signal is also capable of passing through walls and in most cases can reach anywhere inside a typical home. 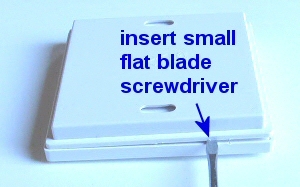 The surface mount wall remotes and timers all use the same type of 'press fit' housing.You will need a small flat blade screwdriver to pry the back cover off, exposing the battery compartment and programming button (if it has one). Insert the blade near a corner, to start separating the back cover from the main housing (see pictures at right). Rotate the blade gently (picture 2) to continue the process of separation, but don't try to do it all at once. 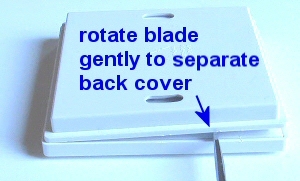 Move the blade along the edge and rotate it gently as you move around the 4 sides and you will find that it comes off quite easily, even though it is fastened tightly when snapped in place. Note the two mounting holes in the back cover that can be used for attaching the switch to the wall. These switches are attractive, bone white, low profile units that do not require an embedded box. They operate on button batteries for many years, and the radio control signal has the ability to reach anywhere in a typical home, passing easily through walls (but more signal loss if walls are concrete or brick). Our multi-channel hand held remotes have up to 15 channels (plus ALL channel) that can be programmed to control blind motors in various different rooms and hallways throughout the house. These remotes transmit the same signal as the timers and can be used in conjunction with them. Once the cover is removed, you will see the button battery compartment and the programming switch (P2). You can remove the button battery cover by inserting a coin in the slot provided. Insert the CR-2430 button battery into the battery receptacle (make sure the stamped + symbol is facing up). If you have to replace the battery, the event memory settings will be retained when you change the battery, if you change the battery within 1 minute and do not touch the metal clip on the battery holder. You should be able to see the P2 programming button beside the battery compartment (see picture). 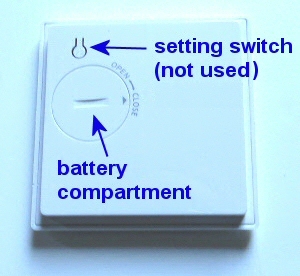 The single channel wall switch uses this button for programming the motor functions, but the timer unit does not use this (even though the plastic button appears to be there).